Yanmar Cogeneration Systems are kind to people and the environment. 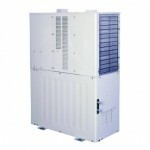 The mCHP unit delivers constant heating and electric power while providing complete environmental comfort. Their Cogeneration systems utilizes up to 88% versus 49% from traditional “from-the-grid” sources. This provides significant energy savings year after year. With the Yanmar mCHP Black-Out Start (BOS) model, no matter how bad the weather is outside you can have peace of mind knowing that your system will continue to provide heat, electricity and hot water when the traditional grid system goes out. With maintenance intervals of 10,000hrs and extended warranty packages of up to 60,000hrs or 10yrs you will have worry and hassle free years of operation! Weather can be unpredictable. Severe weather like Nor’easters, hurricanes, blizzards, and ice storms are reality here in New England. Losing power doesn’t have to be. With a Yanmar Cogeneration System, you are not dependent on the power grid. This means security, refrigeration and technology system will continue to operate even when others have lost power. 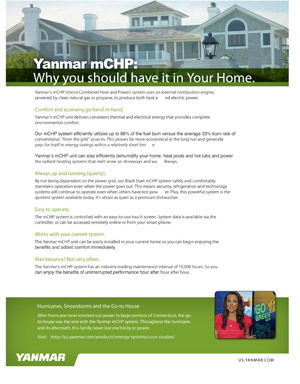 Why should you have a Yanmar system in your home? Our staff is ready and able to design, install and service your Yanmar Cogeneration System. Don’t wait until the next storm to think about Cogeneration. There is no better time to install a mCHP than right now.